ACEH BESAR (AFP) - Thousands prayed at mass graves on Wednesday (Dec 26) to mark the 14th anniversary of the 2004 Boxing Day tsunami, one of the worst natural disasters in history, even as aid workers raced to help victims of the latest killer wave to hit Indonesia. The disaster killed about 50,000 people in other countries around the Indian Ocean, bringing total deaths to about 220,000. 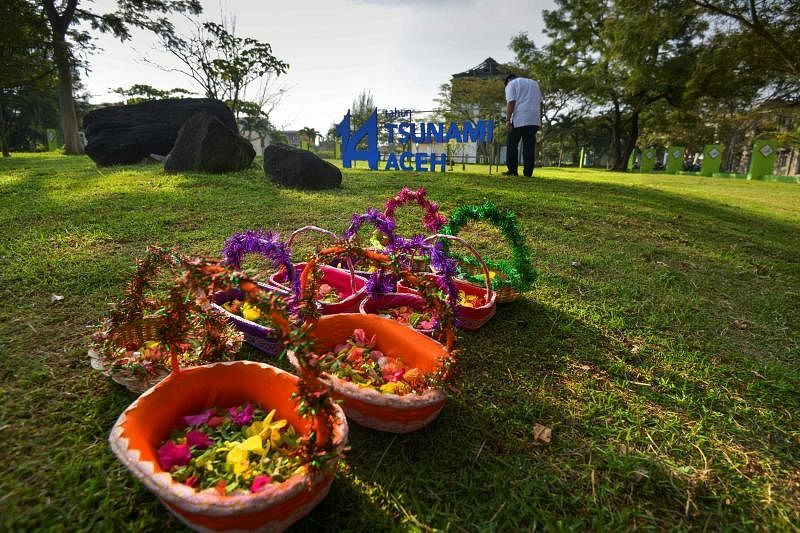 The commemorations are this year particularly poignant after a volcano-triggered tsunami struck another part of the country without warning on Saturday, sweeping over popular beaches and inundating tourist hotels and coastal communities, killing over 400. Thousands paid tribute to the 2004 tsunami victims at a mass grave in Aceh Besar regency where nearly 47,000 are buried under a grassy field dotted with black rocks meant to symbolise a tomb. "None of my family members have been found, but I believe they're buried here," said mourner Dewina, who carried flowers and incense sticks to burn. "I lost my mother and three siblings. I survived after floating out to sea and was rescued by a fishing boat," he told AFP. "Fourteen years have gone by and life goes on. All we can do is pray." "I could not believe that I found my wife after all these years of searching and praying," he told AFP in a recent interview. "I've been waiting and wanting to see (her body) with my own eyes." He had taught his daughter to memorise the family's address so she could return home if she ever got lost. "If she was alive, she'd probably be in college now," he said.